The closure of Barclays Bank in Henfield ‘is a huge blow’ to the village, according to Horsham District councillor Mike Morgan. The councillor for Henfield ward said he would be speaking to Barclays about installing an ATM at an alternative site in the village. Yesterday, it was announced Barclays would not be reopening its branch in the high street after its ATM – containing £88,000 – was stolen in a ram raid on April 15. Mr Morgan said: “It is a huge blow to Henfield that Barclays Bank have decided not to reopen following the incident early this year. This following the recent closure of Lloyd’s and Natwest Bank leaves the village without mainstream banking facilities, which I fear will be the way that other rural towns and villages throughout the country will find themselves in. Fortunately in Henfield we still have our Post Office. 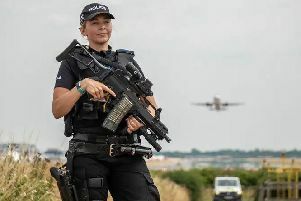 At the time of the ram raid, Sussex Police said the cash machine was found in a burnt-out Nissan Navara 4x4 pick-up truck in Dunsfold later that morning and police were hunting for suspects. Detective Sergeant Kieran McDonald said: “We are investigating this ram raid and linked criminality. We are immensely grateful to the local community for assisting us in our enquires to date. “We are interested in speaking to anyone who witnessed the event or who saw any activity at the stated locations and times. We would also appreciate it if people could review any dash cams or CCTV which were recording at or near the locations described, and if they find any significant material to contact us. We are particularly interested to hear about any vehicles that appeared to be in convoy with the Navara.” Anyone with any information was asked to report the details online or phone 101, quoting serial 157 of 15/04. Alternatively, you can visit the Crimestoppers website or contact the independent charity anonymously on 0800 555 111.